The Atrax highly visible series of indoor/outdoor displays are designed for applications wherever clear messages or weight information must be seen from a distance. Suitable for a wide range of applications including remote scale display, vehicle guidance messages for tugs and ground support vehicles and flight information displays in cargo and airside operations. The high quality display is clearly visible in any lighting condition. Highly efficient LEDs virtually never need replacement and lower energy costs. 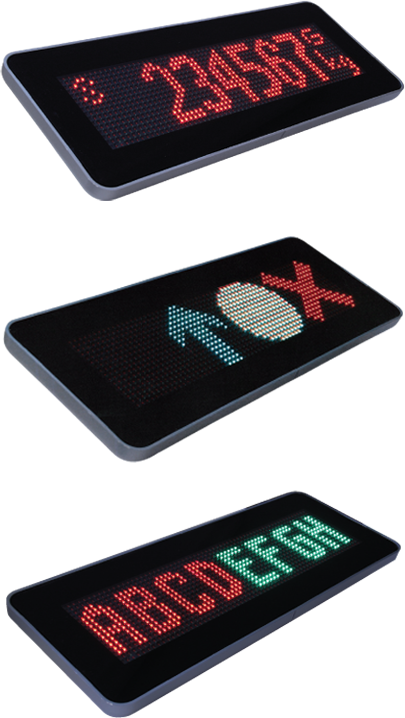 An active display area of 640 x 160mm with an LED array of 64 x 16 pixels allows display of all characters, numerals and many symbols. Chinese characters can also be displayed (may need loading into font set). Can display red, green and amber (red + green) colour. The 140mm high characters allow a viewing range of 120-140 metres. The high intensity LEDs offer a wide viewing angle that can be read in direct sunlight, are long lasting and provide lower energy consumption thereby reducing costs. Serial communication over RS232, RS485 or 20mA current loop as well as Ethernet TCP/IP are standard. Wireless interface option available. The supplied tilt stand makes wall, desk-top or pole mounting a simple matter. Standard VESA mounting holes are included on the rear case allowing a huge range of VESA compliant mounting hardware to be used.